There is a continuing and interesting dialogue on the Constitution. The majority of Sri Lankans is strongly apprehensive of federalism and believes that maintaining the status quo with regard to the current limits on devolution of power to the provincial councils and maintaining a strong central government would serve the goal of promoting and protecting peace and harmony among all groups of Sri Lankans. Some Sri Lankans, however, are somewhat open to the idea of federalism, as USA too has a federal system. Additionally, Mr. C.V. Wigneswaran, the Chief Minister (CM) of the northern provincial council (NPC) also joined the debate on 06 August, 2017 on the occasion of the visit of a group of British parliamentarians to Jaffna. He stated that “…the Tamils of the North and the East opt for a Federal Constitution to preserve their language, religion, as well as their culture, traditions and terrain…”. ‘Political’ compulsions of the above option is well brought out by ethnic, language, and ethno-territory occupancy based rationalizations included in the above referred to presentation(which rationalizations, could be factually and historically challenged –but which is not the purpose of this article). This article attempts to introduce and install into the Sri Lankan Constitutional debate, the key findings of recent authoritative research on federalism as a form of governance in multiethnic/linguistic countries. The research results would enable all Sri Lankans to realize the hidden dangers that Sri Lanka would be exposed to in using ethnic/language based identities and an ‘occupancy of territory by ethnic group’ criteria to mainly define constitutional decision-making and devolution of power. Hopefully it would persuade all Sri Lankans to look outside of the ‘ethno-political advantage box’, as research results reveal that risks may overwhelm the hoped for advantages. First and foremost it needs to be said that if a ‘federal constitution’ is foisted on Sri Lanka, what the country would inherit is the most unstable form of federalism, called ‘ethno federalism’. It will not be the (‘pure) federalism’ introduced by USA to the world, and later taken up by countries such as Germany, Austria, Australia and the majority of federal countries in South America, such as Argentina, Brazil, Mexico, and Venezuela. In USA, the States (territories) were not demarcated on ethnic or language basis. The federal scenario visualized, by some, for Sri Lanka is different. Firstly, unlike in USA, the request is to demarcate a federal region based on ethnicity and language. The Second fact is that the whole area of Sri Lanka out of which an ethnic federal region is opted to be established, is governed as one small country. In the American case it was comprehensively different. The USA federal structure brought together 19 separately governed large territories to form one country. Henry E. Hale, Professor of Political Science and International Affairs at George Washington University, USA coined the term ‘ethno federalism’ to describe federal structures introduced into multi ethnic and/or linguistic countries to accentuate the ethnic/linguistic divisions. Hale explains: “an ethno federal state is a federal state in which at least one constituent territorial governance unit is intentionally associated with a specific ethnic category”. Sri Lanka’s north and east unit (as per CM’s option) would fit this definition of ethno federalism perfectly. Hale’s most important research finding is that “…….ethno federal states are more likely to collapse when they contain a “core ethnic region”. What then is a core ethnic region? Hale describes that a core ethnic region is a single ethnic federal region/unit that enjoys dramatic superiority in population of that specific ethnic category. The northern province in Sri Lanka taken alone as a unit or in combination with the eastern province would form a ‘core ethnic region’, according to the Hale definition. Why does a core ethnic region carry high risks? A core ethnic region substantially increases the propensity for conflict between that core ethnic region and the central government. Politicians who use ethnicity, language etc. to gain political muscle and might would ultimately create a power centre built on ethnic and language identities in the core ethnic region, leading to conflict with the central government. This phenomenon has been observed in all ethno federal countries that failed. The research conducted by Professor Ashutosh Varshney (an internationally reputed Indian scholar and Sol Goldman Professor of International Relations and Social Sciences, at Brown University, USA) further complemented and strengthened the research findings of Professor Hale. These were conducted in India. Varshney after analysing demographic data from many States in India showed that it was not the federal system per se that helped India to manage centre-periphery relations satisfactorily. The most important factor, according to Varshney, is the manner in which a minority language group (based on country-wide language-speaking statistics), enjoying the majority language status in a State gets further sub-divided (or a better term is ‘classified ’) by other demographic factors. When the majority language speaking group in a State is further demographically divided in such a manner as to inhibit the monolithic identity formation around that major language -speaking group ,the ensuing phenomenon is called ‘crosscutting cleavage’. In this situation the opportunity for ethnic ‘card playing’ politicians to mobilize the majority (local) language speakers against the Central Government is substantially constrained. The opposite is the ‘cumulating cleavage’ and occurs when the identity of the majority language speaking group in a State (being a language spoken by a minority at the country-level) is further strengthened due to the presence of other sympathetic demographic factors. In such a situation, opportunities abound for language or ethnic card playing politicians to mobilize the majority (local) language speaking population in the State against the Central Government. In India, the cumulative cleavage is seen only in Punjab and Jammu Kashmir (JK) in the north and in six very small States such as, Mizoram, Meghalaya, Nagaland, and Assam in the north-east. Other States with national minority populations, forming local majorities, do not have cumulating cleavages. Despite the federal system of governance being in place in India for over 60 years, there were tribal/language based movements in the north-east; these continue on even at present in some of the north-eastern States, the tempo rising and falling as per circumstances. Punjab had a strong, armed secessionist movement which was stopped on its tracks, mercifully for India, during the watch of Prime Minister Indira Gandhi through military means. As it is widely known, JK continues to be in a disturbed state. -the immense strength of the Indian armed forces continuously and consciously developed by successive governments -and to a lesser degree the diplomatic/economic/development packages offered to some north-east States allowed/allows India to keep these conflicts in check. Another salient factor is the location of Punjab and Jammu Kashmir (JK) and the six States in the north and east, (which has not been directly referred to by Professor Varshney), but is believed to be of immense significance with regard to agitations and disturbances in these States. All the above-mentioned eight Indian States border other countries. JK and Punjab border Pakistan. The six northeast States (Assam etc) are connected to Indian mainland by very narrow ‘neck of land’ and shares borders with four neighbouring countries of India. There is nothing fundamentally wrong with having borders with other countries. These cannot be altered. But the geo-political impact of the location has to be factored in when strategic plans and key national decisions are made. The probable geo-political influence on the above eight Indian States is well recognized by India, and the State of India has national strategies to deal with them, whichever government comes to power. In a similar vein Tamil Nadu is also very close to Sri Lanka’s north and east. It is a given, and there is absolutely nothing wrong with that. But like what India had done in its case of geo-political actuality, the theoretical (and by experience the practical) probability of geo-political influence on Sri Lanka should also be recognized and factored into strategic policy making and Constitution drafting by Sri Lanka. Adherence to pure legal and theoretical constitutional concepts of power devolution has to be balanced with the historical geo-political negative outcomes experienced by Sri Lanka. It is very clear that the north and eastern provinces of Sri Lanka fits very well with the high risk ‘core ethnic region’ of Professor Hale and the high risk ‘cumulative cleavage’ phenomenon of Professor Varshney. Hence, Sri Lanka would be susceptible to the risks of generating centre-periphery tension under a federal option. Thus, it makes good sense for reconciliation-conscious leaders and decision-makers representing all communities as well as all citizens of Sri Lanka to accept the inadvisability of going beyond the 13th amendment as well as weakening, i.e. further reducing the power of the Central Government. 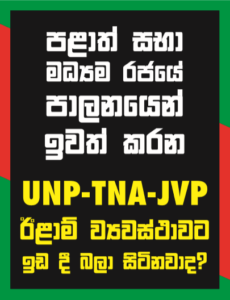 This may trigger a slide towards ethno federalism in Sri Lanka. This does not mean that we need to be static. Other useful constitutional mechanisms as well as policy, administrative, national development programme measures can be taken to promote and sustain national reconciliation and peace in Sri Lanka.